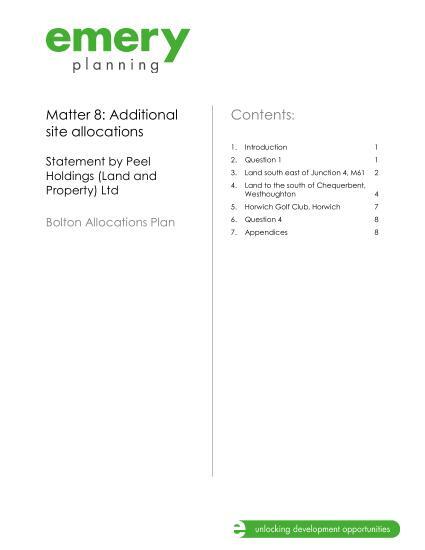 During the 'Allocations Plan' review we became aware of approaches to Bolton Council and plans develop land owned by Peel Holdings at Lee Hall - designated 'Protected Open Land'. The submitted proposal would be a new development, vast in size with new roads onto existing roads (Park Road and Chequerbent), and one that would represent a significant increase in the size of the town (1,700 dwellings). Report by Emery for Peel Holdings. Additional site allocations. Lee Hall. 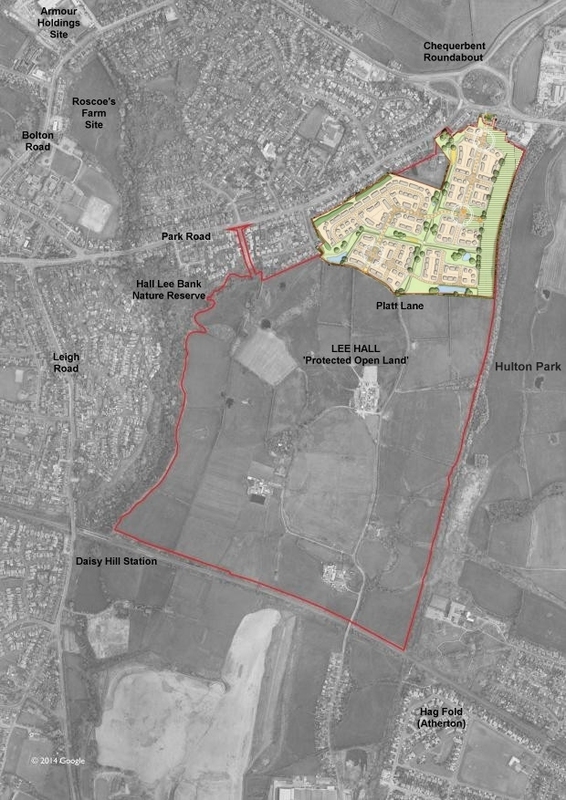 During November (2014) formal plans by Persimmon were brought forward to develop part of Lee Hall, a parcel of land north of Platt Lane in a first phase of that development (300 dwellings). The developers had consultation sessions with interested parties and residents who could attend the Carnegie Hall in November (2014), with a view to putting in a planning application in the coming months. They have also set up a website detailing those plans with links to the plans as on the presentation boards. It was certainly a proposal that has generated much comment concerning "yet more development" and stresses on local infrastructure and services in the town, through two online petitions (one generating 1,600 signatures), in our Facebook group, and in the media. The proposed development was discussed at two S.W.A.N. meetings after the pubic consultation - a number of issues around this 'first phase' proposal; our reasons for objecting to the development listed here. In the meantime the 'Allocations Plan' review was completed and the Bolton Council Local Plan deemed satisfactory and adopted. Previous Westhoughton site allocations were confirmed and Lee Hall remained 'Protected Open Land'. Months passed and on 29th July 2015, a formal and detailed planning application for the Persimmon development on Lee Hall was submitted for 300 dwellings; the site having egress onto Platt Lane and a new, additional junction on the Chequerbent roundabout - a congestion 'pinch-point' and accident blackspot. Application reference: 94696/15. Greeted with dismay by local residents (Bolton News - 5/8/15), S.W.A.N. and local Councillors, the application was seen as a development that was neither wanted, nor needed, nor beneficial to the town - its potential impact on long-suffering commuters a recurring theme in comments against this proposal. 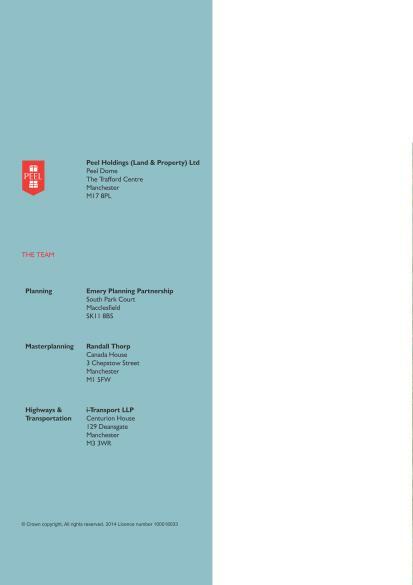 The land at Lee Hall is owned by Peel Holdings - who purchased the Hulton Estate (Bolton News - 30/9/10) valued at £8.5m in 2010 - with Persimmon having the option to buy if their planning application was successful. 'Plans' for the rest of Lee Hall (1,700 dwellings in total) in the public domain. This initial application could set a precedent, opening up all of Lee Hall, and other areas of protected open land for development. In light of the adoption of the much scrutinised 'Local Plan' in December (2014), this application being a development on land outside of 'Local Plan Allocations', it was unlikely for it to be either recommended by the Planning Department or given the go-ahead by Bolton Council. Given the interest and contentiousness of this application, the consultation period was extended and included a further public consultation took place at the Carnegie Hall, Westhoughton (10/9/15), giving a chance to view the plans and speak to those involved, including developer and Bolton Council Planning. Prior to the Planning Committee meeting, the Planning Officer Report was produced with a recommendation to 'refuse' the Lee Hall application. For reference, this is the S.W.A.N. Position and the submitted S.W.A.N. objection (e-mail - 17/8/15). The Lee Hall Persimmon planning application came before Bolton Council Planning Committee, opening up the day's procedures. It followed a site visit (useful to see the local roads; and countryside nature of the area). The Planning Officer's report recommending refusal; Jon Berry began by summarising the key issues with regard to this contentious application: traffic and a problematic further junction onto Chequerbent - for 20 years, since the coming and going of the A5225 bypass, planners have wrestled with too much traffic on Westhoughton roads as the town has doubled in size. Continuing… it was important to keep the buffer of protected open land; there was no need to allocate further land (outside of the Local Plan) - the five-year supply is there. The was mention of the need to preserve the independent character of Westhoughton - which surrounding green space does. S.W.A.N. spoke against, as did a number of Councillors from all parties. Notably, Persimmon didn't present themselves to justify their application - one Councillor commented that with this application Persimmon/Peel were being opportunistic. All Councillors, from across the party spectrum, spoke well, and with no time-limit were able to address specific technical planning points. The decision to reject this planning application was unanimous, reflecting the strength of opinion and feeling from planners, councillors and residents alike. A planning application that has galvanised people, getting them involved in the planning process - 1600 signed a petition, and 167 people objected individually. Comment online was also plentiful. A win for Westhoughton. The refusal and reasons detailed in the Official Decision Notice. We have been here before! Back in the late 90s when Lee Hall was under threat of development leading to the formation of S.W.A.N. and the 1998 Public Enquiry, at which development and the loss of this important buffer land was prevented, resulting in its designation as 'Protected Open Land'.